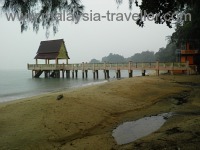 Top Melaka Attractions - Here are my recommendations. 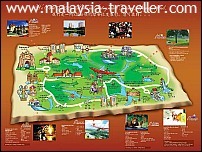 What are the top Melaka attractions? The state of Melaka (Malacca) is one of the smaller states in Malaysia and it does not have lofty mountains or the best beaches but it more than makes up for this with its rich history and wealth of tourist attractions. 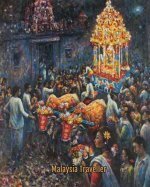 The founding of Melaka is usually attributed to an exiled Sumatran prince called Parameswara who arrived around the year 1400AD having earlier been ejected from Temasik (Singapore). Melaka's strategic position at the narrowest part of the Straits of Melaka, together with the sheltered estuary of the Melaka River, meant that a thriving trading entrepot was soon established with a lucrative spice trade. 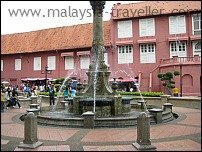 In due course the success of Melaka attracted the Portuguese who conquered the state in 1511 and held it until the Dutch took over in 1641. The British in turn ruled Melaka from 1826 until Malaysia's independence in 1957. These layers of invaders left their marks on the city of Melaka and there are a few other colonial remnants elsewhere in the state. Melaka city is a UNESCO World Heritage site and to add to the area's allure, the state government and private enterprises have created many newer tourism attractions around Melaka state. 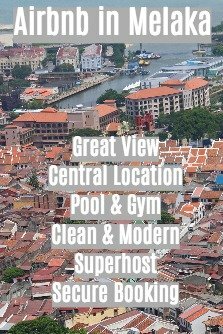 Here are my suggestions for the Top Melaka Attractions based on those that I have visited so far. I may add more to the list as I explore further. 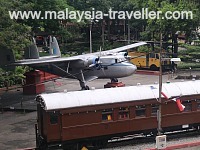 Click on the photo or link for further information on each of the Top Melaka attractions. A lengthy walk around the heritage sites in the heart of this historic city. 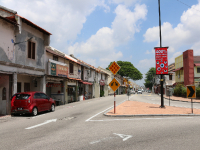 Highlights include Christ Church, the Stadthuys, St. Paul's Hill, Melaka Sultanate Palace, Sam Poh Kong Temple, Kampung Kling Mosque and the famous Jonker Walk. 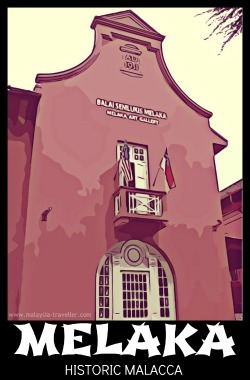 Melaka is crammed full of museums, most of them in close walking distance of each other. Favourites include the Baba Nyonya Heritage Museum, Maritime Museum, Islamic Museum, the Stamp Museum and Governor's House. This retail, hotel and residential development on the edge of the historic core of the city contains a number of attractions such as Shore Oceanarium, Sky Tower Malacca, The Shore Toy Museum and 3D Interactive Park. Also a shopping mall with food outlets. A 45 minute, 9km river cruise down the historic Melaka River opens up vistas of the city that cannot be seen from the road. A comfortable and inexpensive way to see the sights. Encore Melaka is an impressive Melaka-themed cultural performance using state-of-the-art theatrical techniques in a modern purpose-built theatre. 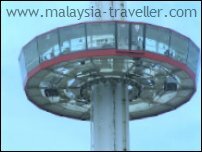 Calls itself the 'First Revolving Gyro Tower in Malaysia'. 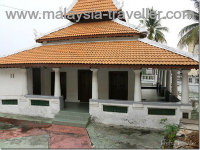 Located in the city centre it provides a panoramic 360 degree view of Melaka. 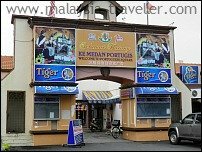 Descendants of the Portuguese settlers can still be found in a small community in Melaka and they strive to maintain their cultural heritage. 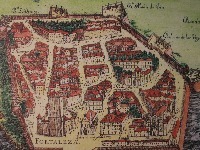 At Portuguese Square you can visit a small museum and sample some of their cuisine. 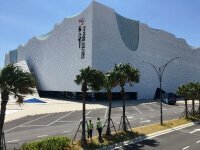 This new Top Melaka Attraction is a lavish museum and tourism complex dedicated to the famous Malay hero Hang Tuah located at Kampung Duyong, Melaka. 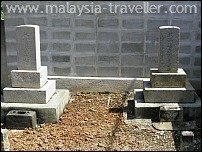 This is a rather quirky choice for a Top Melaka Attraction - a small cemetery containing 36 graves dating from 1911 to 1944 of former Japanese residents of Melaka (and one dog). Seldom visited and little known. Read about it on my blog. 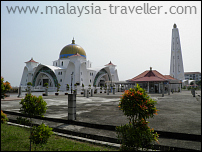 Masjid Selat Melaka is a modern mosque in a hybrid Arab/Malay style on a reclaimed island (Pulau Melaka) close to the town centre. At high tide the mosque appears to be floating above the sea and it has been nicknamed the Floating Mosque. 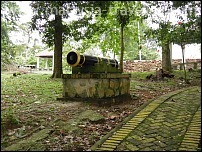 The historic Portuguese/Dutch Fortress of Malacca was destroyed by the British in 1807 but there are some remnants still visible and worth seeing. 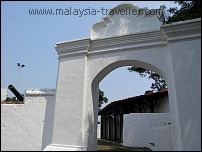 St. John's Fort Melaka is a small white 18th century fort built by the Dutch on a low hill with views over the city of Malacca. 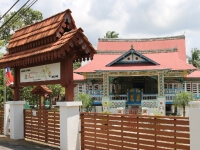 The Chitty Village is home to a unique hybrid community of Hindu Peranakans, descendants from Tamil traders who settled in Melaka over 500 years ago. 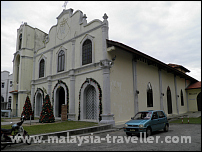 St. Peter’s Church in Melaka is the oldest functioning Roman Catholic church in Malaysia. You can read about it on my blog. Not many cemeteries in Asia can claim to have had a real Saint buried in them but this is one of them! Read details here. Rest your feet at Coronation Park, one of the few green spaces in the city, with magnificent rain trees, some transport-related exhibits and historical monuments. 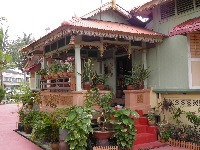 Villa Sentosa is the place to visit if you want to see what life is like inside a traditional Malay house and the actual owners may give you a tour around. 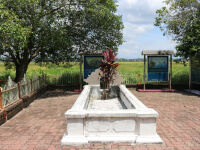 This is believed to be the burial place of Hang Jebat, a warrior and Malay hero who lived in the 15th century. 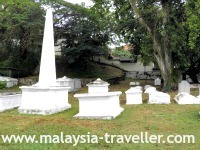 There are many tombs and mausoleums in Melaka. 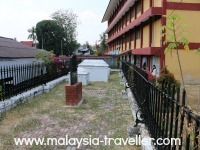 This one, the grave site of a holy Filipino man, is regarded as a keramat, or sacred place in Melaka. 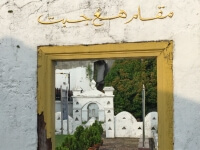 This is the burial place of Hang Kasturi, one of the five brothers-in-arms led by Hang Tuah who served in the court of Sultan Mansor Shah of Malacca during the 15th century. 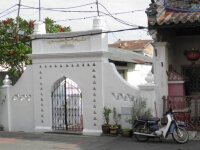 Munshi Abdullah House is the humble birthplace in Malacca of Abdullah bin Abdul Kadir (1797-1854) who was conferred the title of Father of Modern Malay Literature. Joson Numismatic Collections on Jalan Tun Tan Cheng Lock, Melaka is my kind of shop with old banknotes, coins, stamps, vintage advertising and other collectables for sale. Take a stroll along historic Tranquerah (Jalan Tengkera) and see some of Melaka’s lesser known sights, off the beaten tourist track. 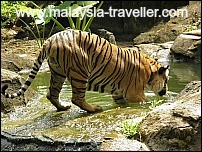 Melaka Zoo is one of the best zoos in Malaysia. Read my review here and see details of entrance fees, opening hours and directions. 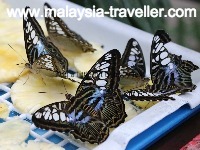 At Melaka Butterfly and Reptile Sanctuary you can see butterflies, crocs, snakes and a whole bunch of creepy crawlies amid lush tropical gardens. 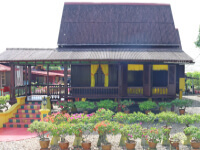 Mini Malaysia and Asean Cultural Park showcases the traditional wooden houses of the 13 Malaysian states together with cultural activities. I’ve never been a fan of crocodile farms but Melaka Crocodile Park (Taman Buaya Melaka) was better than I expected. Here is my review. 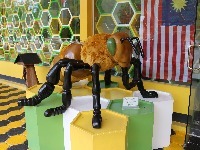 At Malacca Bee Gallery you can learn a lot about bees and apiculture and buy some delicious and healthy honey products. 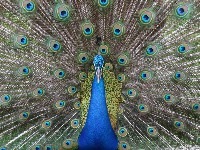 Melaka Bird Park is a fun place to bring the kids and see exotic birds feeding from the palm of your hand. 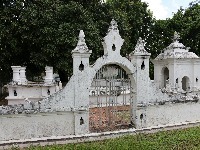 The Dutch built a fort on the northern edge of Melaka state on a headland with views overlooking the Straits of Malacca and the River Linggi. Some of the original walls still stand. 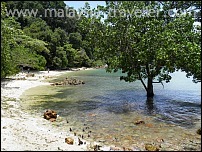 Cape Rachado (Tanjung Tuan) is a small promontory of Melakan territory surrounded by Negeri Sembilan state. After a pleasant walk through a forest reserve you can see an old lighthouse and take a steep flight of steps down to a secluded beach. 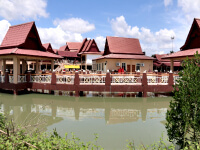 This place promotes itself as a 520 hectare integrated resort. 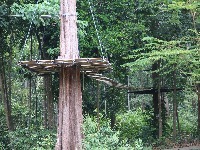 Highlights include A Famosa Water World, A Famosa Safari Wonderland and A Famosa Cowboy Town. The Water World has some exciting slides and we enjoyed the other two attractions. 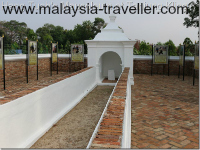 Find out how a British soldier came to be buried with his dog and horse in this quiet corner of Melaka state. Details on my blog. 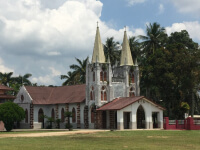 Ayer Salak Village is not a mainstream tourist attraction but its pretty church, tranquil setting and interesting history make it worth a visit. The small town of Masjid Tanah contains this picturesque mosque and a modest clock tower and is surrounded by scenic countryside. Read about it on my blog. 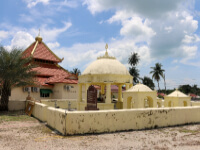 The coastal village of Tanjung Kling, just outside of Melaka city, hosts a mausoleum for Hang Tuah, Malaysia's legendary warrior hero. Read more on my blog. 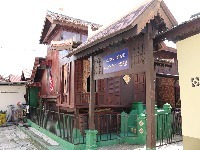 At Galeri Demang Abdul Ghani you have the chance to look around one of Melaka's most attractive traditional houses and admire its unique architectural style. 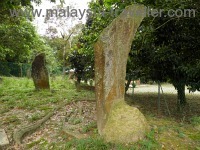 At various spots around Melaka state and neighbouring Negeri Sembilan can be found ancient megaliths of uncertain origin. Read my theory here. 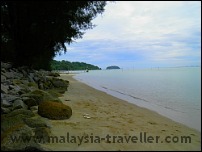 This pleasant beach close to Melaka City is popular with locals looking for a place to escape the heat. Ikan Bakar Klasik Terapung Umbai is a grilled seafood food court located at Umbai some 12 km east of Melaka City. It gets mixed reviews. 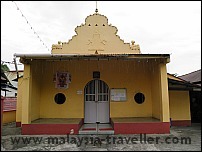 Makam Tun Teja is the burial place of Tun Teja Ratna Benggala, the beautiful wife of Malacca's Sultan Mahmud Shah who reigned from 1458 to 1511. Her story is one of love and betrayal. 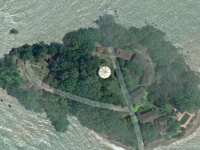 In the past tourists were able to witness Hawksbill Turtles nesting on the beach of this island just off the coast of Melaka City but it is now closed to the public, doubtless affected by ongoing reclamation work. Fate of the turtles is unknown. I doubt this old Portuguese Well was really a Top Melaka attraction even when it was open but now it appears to be closed to the public. 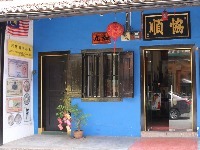 There are numerous traditional Melaka houses scattered over Melaka State, some open to the public but mostly private homes. 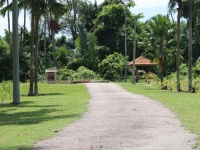 This one is at Kampung Semabok on the outskirts of Melaka City. 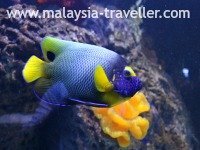 There are too many of these Top Melaka Attractions to cover in a day trip so you will need somewhere to stay. I recommend you stay in a hotel which matches the city. This means not a boring tower block managed by an international hotel chain but a distinctive local hotel with charm and character, possibly quirky, definitely with a bit of history.